Lisbon, Portugal is famous for its pastel coloured buildings, walls covered in tiles, seafood and of course pasteis de nata. 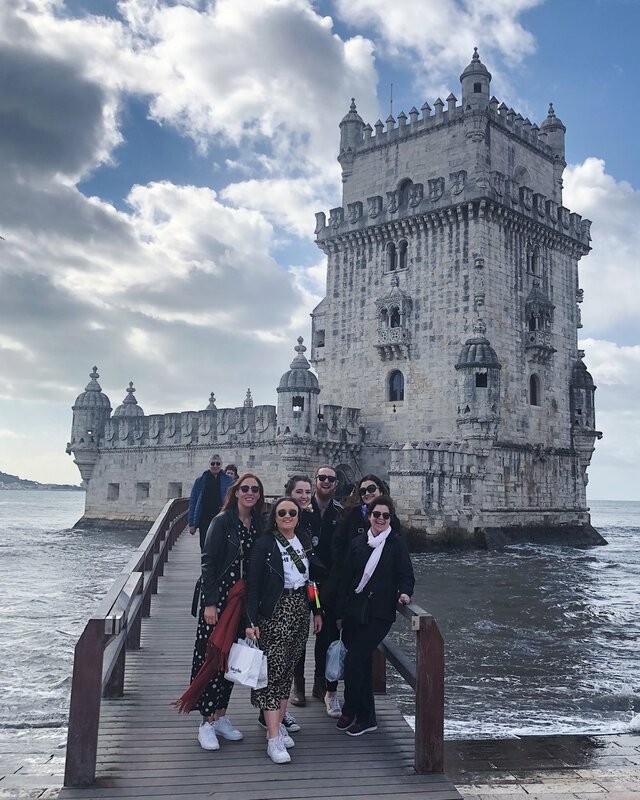 The stunning landscape, delicious food and an abundance of things to do made it the top spot on our list for our belated Christmas party to Lisbon. While beers were drank and silly dancing done it was also a great weekend of team building and bonding. We stayed in a beautiful apartment in the heart of the city from where we could walk (or tuk-tuk) everywhere! If you’re thinking of heading to Lisbon then read on for our recommendations, you will not regret it. This is the most reviewed restaurant in the world on TripAdvisor. It has a big seating area but also does takeaways (with big queues). They are famous for the paseis de nata – little custard tarts that are delicious! These tarts are everywhere in Lisbon, but these ones were 100% the best ones we tried and worth the tuk-tuk ride there! While in Belém a visit to the tower is a must! Built on the Tagus River a small bridge connects it to the mainland. It was once used for defence purposes before being used as a prison. In 1983 it was made into a UNESCO world heritage site. Lisbon is a city built on hills and this became very apparent to us while on the way to the castle. The hilly steep climb was so worth it though for the incredible views over the city. We arrived during sunset and it truly was breathtaking. We ate in this small tapas restaurant on the recommendation from a friend. The food was absolutely superb. It’s a small unassuming place that you would easily walk by without giving it a second glance. The goat’s cheese was a particular favourite amongst the VTT team. I would eat it all day everyday if I could! If you’re going to Lisbon book this place immediately! *please note the below is not a picture of the restaurant.. We were too busy stuffing our faces to take any photos! We loved this place so much we went twice. There are so many options to try. Between us we had a cheese board, turkey burger, sea food risotto, veg curry and an octopus hot dog. Everything was delicious. It’s crowded during lunch time with everyone acting like vultures looking for empty seats, so we’d recommend going just after the lunch rush. We went to this bar for some pre dinner cocktails. The inside was an array of miss matched printed furniture, low lighting and obscene pictures and decorations. We loved it! The cocktails were expertly made although fairly lethal!